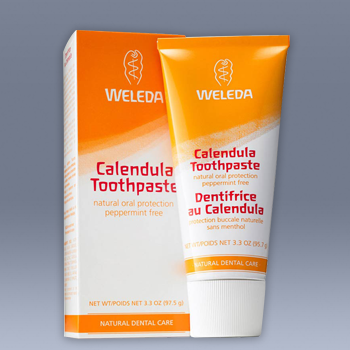 Peppermint free Calendula Toothpaste gently but thoroughly cleans your teeth using natural chalk. Gentle fennel oil is an alternative to traditional peppermint oil, leaving the mouth feeling clean and fresh. Regular use helps protect against plaque build up while soothing calendula helps keep the gums and oral cavity healthy. Water (Aqua), Calcium Carbonate, Glycerin, Magnesium Aluminum Silicate, Alcohol, Calendula Officinalis Extract, Commiphora Myrrha Extract, Foeniculum Vulgare (Fennel) Oil, Xanthan Gum, Ammonium Glycyrrhizate, Limonene*.